Softwash is a form of cleaning that has been designed for the treatment of roofs, walls, and other aspects of building exteriors. This is a non-aggressive form of cleaning which utilises specific chemicals and equipment in order to offer both safe and effective cleaning. It is best suited to cleaning porous materials. At MC Property Maintenance, we have extensive experience carrying out softwash cleaning, as well as other forms of property cleaning and maintenance. We work across the South East of England, everywhere from Sussex and Surrey to Kent and London. If you are interested in having softwash cleaning carried out at your property, please get in contact with our team today. Softwashing uses a powerful chemical in its cleaning process. The cleaning agent kills 99.9 per cent of microbial life, as well as being a very strong algaecide which in the process kills moss and lichen. 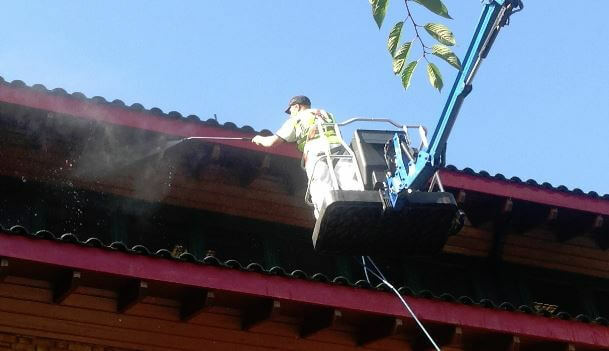 This makes it extremely successful in cleaning the exterior of buildings. It does not damage any material used in construction and additionally breaks down rapidly after use. It should be noted that the softwash that we carry out at MC Property Maintenance does not utilise bleach in any way. This means that the cleaning will not cause any degradation to leadwork, tile fixings, or aluminium. We start by preparing the surface and the surrounding area for cleaning. It should be noted here that the chemicals used can have a damaging effect on plants – this starts with almost instant discolouration, and can be more adverse with larger spills. Additionally, animals should not be allowed near surfaces that have been cleaned with the chemicals. The treatment begins with application to the surface. We carry this out with sprays and any other necessary materials such as telescopic poles for roof-high extension. The product begins cleaning immediately and the actual process of cleansing takes less than an hour. It will take a little time for moss and lichen to detach from the surface. It should be in excess of four years before any moss or lichen return to the surface, and it will often be much longer. At MC Property Maintenance our team have extensive experience carrying out a full range of cleaning services on building exteriors. So, if you are not sure whether softwash is the right option for you, we would be happy to provide you with advice. Are you interested in having softwash cleaning carried out on your property? Whether you would like to get a quote or just need more information on how the service works, our friendly team can help you with any questions. You can get in contact with the team today by calling on 01243 262714 or by filling out the contact form. We will get back to you as soon as possible.